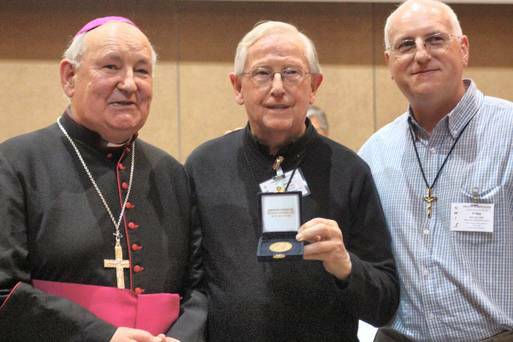 An Irish priest has been awarded the Vatican’s ‘Good Samaritan’ medal in recognition of his decades of work with the sick and the Oblate order’s Lourdes pilgrimage. It was given to him as a tribute to the years of service the priest has given to the “sick and most vulnerable” as the director of pilgrimages with the Oblates of Mary Immaculate (OMI) order in Dublin. Speaking to the Irish Independent, Fr Mulligan described himself as “just a figure head at the top of a great, great movement of people”. He said he had been to Lourdes well over 100 times, and this year was his 27th year in a row. This year also marks the Co Westmeath native’s golden jubilee as a priest. “I didn’t expect it at all, and I don’t deserve it either,” he said. “I am just an ordinary working priest. Lourdes is a place of peace and contentment. You are faced with suffering on a massive scale. Your health is your wealth and if you haven’t got that, you’ve got nothing,” he told the Irish Independent. The founder of the Oblates of Mary Immaculate (OMI), St Eugene de Mazenod, first sent Oblates to Britain and Ireland in 1841. The order’s association with Lourdes began in 1883. Twenty-five years after the apparitions, the first ‘official’ English speaking pilgrimage to Lourdes took place. It was organised by the Oblates and was led by Fr William Ring OMI. The pilgrims travelled overland from Dublin and London. Since then Oblates and pilgrims from Ireland and the UK have been travelling to Lourdes annually and each year up to 120 sick pilgrims are accompanied by volunteers and healthcare staff. There are over 100 Oblates, priests and brothers, gathered in small faith communities across Britain and Ireland.